More than 114,000 people died in an earthquake that figured in the seismic scale at 8.9. Epicentre in the west of Sumatra, which is an island of Indonesia the quake hit in the early morning of December 26 and it triggered a tidal wave that devastated a vast stretch of shores across nations killing and injuring thousands of people. Though the Pascific Tsunami Warning Centre came to know about the impending earthquake nearly an hour ago, the US organisation was clueless regarding who to contact. In some areas, the earthquake-induced tidal serge rose to 30 feet in height. 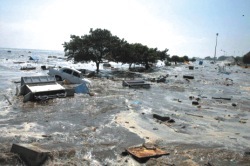 The giant tsunami waves swept into the coasts of Indonesia, Malaysia, Myanmar, Sri Lanka, the Maldives, India and southern Thai islands preferred by tourists leaving the seaside towns and villages in a shambles. Though at first the details were sketchy, soon it dawned on the global community that magnitude of the disaster was of a massive scale. Sri Lanka is the hardest hit in this sudden serge of the Indian Ocean. More than 13 thousands were reported to have died with a million more still missing. In Indonesia alone some eighty thousand people were feared to have died as it took the full force of the surge that lasted no more than ten to fifteen minutes but had left in its wake a scene of devastation never before seen in the last 40 years. The quake was the fifth largest in the world since 1900 and biggest since 1964. In southern Thailand at least 866 people were killed, including foreign tourists at popular seaside resorts, and 5,000 injured according to the official source. In Malaysia 44 people, including many elderly and children were reported to have been killed. In the low-lying area of the Maldives a British tourist and 14 other people died. In Bangladesh a father and his child were killed as a tourist boat capsized from large waves. The calamity was sudden. Although the waves were not as high as it was in Indonesia and Sri Lanka, the Indian shore has also been swept away by the seawater. Bangladesh escaped the scourge of the tidal surge, but the early morning tremor left many feeling panicky, and the disastrous effect of the surging water on coasts across Asia certainly intensified that fear. The death toll was still rising at time of writing this news. According to Khulna police, outlawed parties like Purba bangla Communist Party (PBCPJanajuddho) are using women to carry arms and collect tolls for them. Recently the police seized a nine-mm pistol from Khadija begum an armed cadre of the PBCP. Another woman Halima Begum, the wife of a PBCP cadre was arrested in October from Rupsha upazila, when she was trying to extort money from a businessman. In February, Sonadanga police arrested 34 year old Anowara Begum who had been carrying a six shooter and pipegun. Later the police found a Chinese rifle, a pistol, three bombs and four daggers from her house. The Khulna police say that many of the women are poor and agree to undertake such risky operations in exchange of payment from the outlawed parties. It happened again. In another brutal attack on December 24, eight women AL members were injured as a powerful bomb went off at a meeting in Sylhet. The Mohila Awami League (AL) meeting was being held at the residence of Syeda Zebunnessa Haque, President of the women's wing of the party who was badly injured and had to be operated upon. The other injured were the district Mohila AL's General Secretary Ruby Fatema Islam, Vice-president of the unit, city ward commissioner Shahan Ara Begum, Joint Secretary of the unit and the city mayor's wife Asma Kamran and three other activists Khaitunnesa, Madhury Goon and Bibharani. According to Shahan Ara, the meeting started at around 4p.m. and about forty minutes later a bomb was hurled from outside the room. The police however, have said that the 'evidence does not suggest' the locally made bomb had been hurled from outside the room. Meanwhile the city and district units of the AL brought out a big protest rally at Court Point. A mineworker Yasir Ali was killed and four others including a North Korean mine expert were critically injured in an accidental explosion inside the mine in Maddhayapara Hard Rock Project in Rangpur. According to Petrobangla sources the Korean company under which the project is operating, did not follow proper safety codes leading to the accident. Only one and a half-week into the shocking murder of Sabera Begum, the Headmistress of Siddeshwari Girls' High School, along with her daughter, another brutal murder of an 63 year old teacher has left the nation in a state of uneasiness and tension. An elderly professor of Economics of Rajshahi University, Muhammad Yunus, was stabbed and hammered to death only some 150 yards away from his house last Friday morning when an unsuspected Yunus was returning home after his regular morning walk. A revered economist who had been aligned with left politics and someone who was known for his progressive and liberal thinking Yunus survived another assault on his life only 9 years back in 1995. President of RU Bangabandhu Parishad Yunus' pronounced alignment with the AL as well as his staunch opposition to the fundamentalist political parties and their student wings in the RU campus. Islami Chatra Shibir, who has a stronghold in the RU campus is suspected to be behind this killing. The murder sparked violent reaction from students, teachers, commoners, people belonging to different professional groups all over the country. Hundreds of angry students put barricades in the Dhaka Rajshahi highway and forced the traffic on both sides of the road grow miles long. A brilliant student all through his life and a respected teacher, Yunus served in various important positions at the university, was chairman of the department, elected to the Senate twice, and worked as students' advisor and proctor in the early 90s. While the demand of a section of zealots to declare the Ahmadiyyas non-Muslim should have been dealt with a strong hand the government banned the Ahmadiyya publications. The government decision wasn't exactly surprising as one particular party with the four party alliance government was behind this hate campaign against the Ahmadiyyas. That particular fanatic group proved so influential that the government, though didn't realise their original demand, didn't dare to refuse their demand altogether. It imposed ban on the Ahmadiyya publications in a bid to appease the fanatics. The Ahmadiyya leaders took the issue to the court and on December 21 the High Court quite expectedly stayed the government ban order. The fanatics however were never pacified and after the court verdict had started mobilising anew regrouping themselves. They had now taken to the streets, bringing out violent processions and threatening the government to immediately on triggering strong criticism from the civil society which is absolutely unlawful, demand that go against all sorts of democratic, ethical and moral rights.